Find hotel near Barcelona Museum Of Conte ..
Barcelona Museum of Contemporary Art (MACBA) is for those who take art seriously. 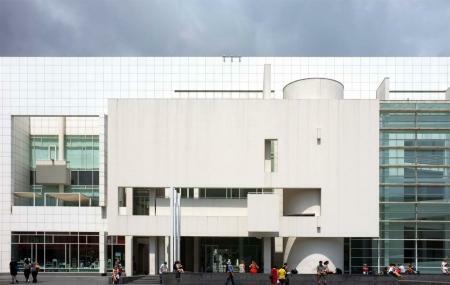 Since its inauguration in 1995, the MACBA has transformed itself into a power player on the city's contemporary arts scene. The permanent collection is located on the ground floor of the main building, and showcases art from the second half of the 20th century. Although some international artists are featured, the collections mainly focus on post-1945 Catalan and Spanish art. The museum also offers a variety of events including lectures, seminars, guided tours and video screenings. Of the three levels of the building, two are accessible to public. There is free Wi-Fi throughout the museum. Last tickets are sold 30 minutes before closing. The museum offers tours to the general public in sign language on the third Sunday of each month. How popular is Barcelona Museum Of Contemporary Art? People normally club together Playa De La Barceloneta and Barcelona Zoo while planning their visit to Barcelona Museum Of Contemporary Art. Lovely exhibitions. My friend enjoyed them a lot even tho he's not a fan of contemporary art. The info is short and very basic in a positive way - you get a good overview what happened in the decades that are shown. Also the building is spacious and fits well the art. Great museum to visit if you are in the area. Perhaps a few more exhibitions would've been great, as there is only three. Would have liked to have seen more.